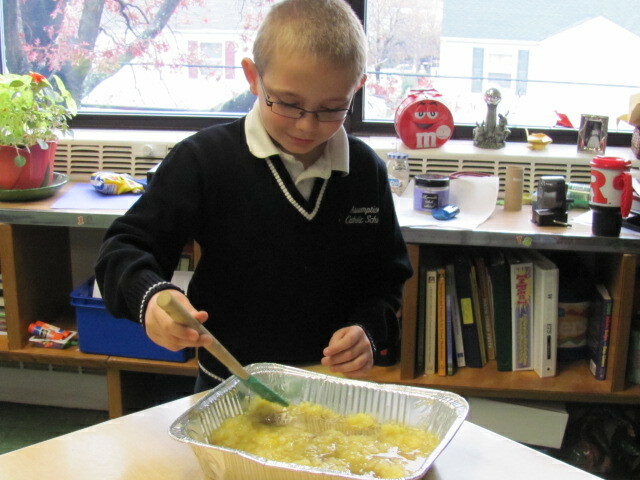 Andrew Charles Baralecki, a fourth grader at Assumption Catholic School, is shown preparing a recipe that will be served next week at the Thanksgiving Feast. “It was Fantastic,” Andrew said after he tasted some of the Pineapple Dump cake he had made for the teachers. All you have to do is layer the ingredients. First a can of apple pie filling, then a can of crushed pineapple followed by a box of cake mix. On top of that you pour two sticks of butter then coconut and almonds if you like. You bake it in the oven for one hour and enjoy the best cake ever baked in my class.